When you are getting a new roof installed, it can feel pretty daunting. There are a lot of choices to be made and even more possibilities that need to be considered. While it can feel scary, it’s important you understand that this installation may be one of the biggest investments you make for your home. With that in mind, we want to give you some tips that will help you make the best decisions for your situation. When you’re armed with information, you’re sure to get through this process with as little stress as possible. If you’re in need of a roof replacement in Fairburn, call SAFG Inc. today. We’ll be happy to walk you through the process and make it a painless experience for everyone involved. When referring to asphalt shingles, they are split into two different categories: architectural shingles and traditional 3-tab design shingles. Architectural shingles boast an incredible level of thickness. They have deep, blended shadow bands, which simulate the look of classic wood shakes, which can really set your home apart from the rest of the neighborhood. Traditional 3-tab shingles are much more common which means you’re sure to have seen them before. They are incredibly popular thanks to how easy they are to install, repair, and the wide variety of colors that are offered. A steep pitched roof can be identified just by looking at your home while standing on the ground. The way you’ll be able to tell if your home has a steep pitched roof is you will see more of the roof from ground level than a low pitch found in a Classical designed home. Steep pitched roofs are typically found in Gothic architecture. Architectural shingles can give steep roofs an interesting and dynamic texture, and their multi-layer, laminated design makes them an ideal choice here. Do I want my home to have a unique look? For homeowners that want their home to stand out in a crowd, architectural shingles achieve that with ease. There are many different designs that can look like classic wood shake or slate. However, if you desire a classic style home, traditional 3-tab hits the mark while still giving the option to choose different colors. Is algae discoloration an issue where I live? While this is not an issue that affects everyone, it is still something that needs to be considered when choosing shingles. There are different types of shingle designed specifically to resist discoloration from algae. Another thing you should consider is a dark color shingle, which is less prone to show staining from algae discoloration. This is one of the more difficult subjects to provide advice for, as everyone has their own individual tastes and style. However, we can give you some advice as to how to narrow down your choices to what works. The first thing you should do is take a drive through your neighborhood. Take a look at other homes near you to see what color choices work well with homes that are similar to yours. They will typically have similar brick and siding work, so this will help you decide on which style will fit best as well. Take some notes about which colors you liked, which could work with your house’s color, and which ones you want to steer clear of. Once you have that list at the ready, take a look at full-size shingle samples to get a close-up view of your options. With these shingles in-hand, you’ll be able to compare them to the elements of your home for a better understanding of how they look together. Many people miss out on how helpful full-size samples are when you’re able to hold them up directly against the brick, siding, and trim of your home. If you’re considering a new color for your trim or different siding, compare those samples with the shingles as well. When you have all of the elements together, it will help you find a unifying look that you’re happy with. Don’t forget to look at these samples in different lighting conditions so you can know how they’ll look both in the day and at night. We recommend you talk to your neighbors to see if they have replaced their roof recently. They’ll be able to let you know about issues they’ve had specific to your neighborhood. If there are a lot of trees around your home, you won’t be sure how they have affected the roofs in the neighborhood and if there’s anything to watch out for with them. 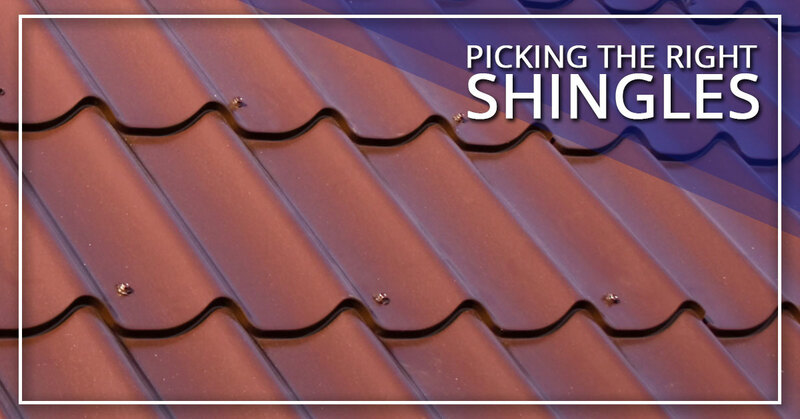 Depending on the tree type, you may want to choose a different color shingle so it either stands out or blends in. If you are a part of a Homeowner’s Association (HOA), they may have specific rules regarding style and color of roofing, so it’s important you consult their guidelines before you make any decisions. If you like your neighbor’s roof, ask them about the shingle color, style, and brand they chose. See if there were any specific features they prioritized when they made their decision. You will also need to consider curb appeal. Whether you are making this your forever home or you’re considering selling it in the next few years, your home will retain a current look for a long time, if you choose a neutral color. However, if you are looking to make a statement with your home, choose a more striking color that gives it a unique feel. Either option has the potential to increase your home’s curb appeal, which then increases the value of your home. While it can be stressful to pick out a new roof, it can be just as exciting. You’re making a decision that can totally change the look and feel of your home. This is an opportunity to breathe new life into an old house. For the best roof installation here in Fairburn, look no further than SAFG Inc. Our motto is “People Over Profits” and we stand by that. Call us today to get started.